McKesson Aluminum Walking Crutches from HealthyKin.com are lighter than wood and provide stability and durability. 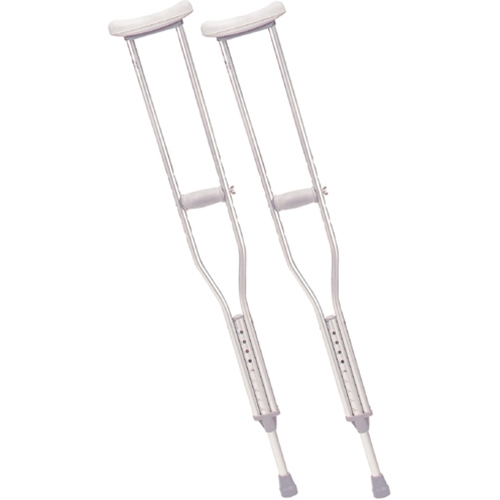 Each crutch is manufactured with a double extruded center tube to ensure additional strength on weight-bearing areas. Extra thick (latex free) underarm pads and hand grips provide maximum comfort when in use. Tool free push-button adjustment allows the height of the underarm pad to be easily adjusted in 1" increments. Hand grips adjust separately without tools to ensure a proper fit. It can withstand a weight capacity of up to 350 lbs. and is protected by a limited lifetime warranty. Great product. Fast shipment and a fraction of the price at other sites. This is the second pair I have ordered - one for inside use and one for outside use. The MeKesson Aluminum crutches are great. There strong and light, as well as adjustable. I would recommend this product to anyone with a leg, knee, ankle or foot injury. The price was very reasonable. Great product from Great company! Thank you for a more than fair price and fast shipping in the usually wicked world of the medical industrial complex. Great price, fast delivery, and a very easy website to navigate. I am very pleased I stumbled across this site so thank you! Very good. The quality of the crutches was good and they arrived when the company said they would be delivered which was quick. Very satisfied! Great price. Perfect size for tall man. Delivered within 24 hours. Just what was needed, when it was needed. Fast delivery. The product (which was the EXACT model that a local supplier would have provided) was 2/3 the cost of the local provider. I highly recommend Healthy Kin and I have ordered other items from them before with the same level of satisfaction. I had hip surgery in sept 2017. Had walked for over 3 years leaning over Rolater pain was so great! Thanks to these crutches I have support and walking straight again! Will help strengthen my back and leg muscles while I’m learning to walk again! Thank you!